Alexander Chuka Iwobi (/ɪˈwoʊbi/ ih-WOH-bee; born 3 May 1996) is a Nigerian professional footballer who plays as a forward for Premier League club Arsenal and the Nigeria national team. Iwobi was born in Lagos before moving to England at the age of four, following a brief stay in Turkey. He grew up in Newham. He is the nephew of former professional footballer Jay-Jay Okocha. His mother is Okocha's sister. He is "best mates" with former Arsenal teammate Tyrell Robinson. Iwobi joined Arsenal while still at primary school, in 2004, and was nearly released by the club at the age of 14 and again at the age of 16. He was first involved in a first-team match as an unused substitute in a League Cup match against West Bromwich Albion on 25 September 2013. He signed a long-term contract with Arsenal in October 2015. On 27 October 2015, Iwobi made his first-team debut for the club, starting in a 3–0 defeat to Sheffield Wednesday in the Round of 16 of the League Cup. He made his Premier League debut four days later in a 3–0 win against Swansea City at the Liberty Stadium, as a stoppage time substitute for Mesut Özil. Iwobi made his Champions League debut as an 85th-minute substitute in a 5–1 defeat against Bayern Munich. Iwobi started in the first team for the 2015–16 FA Cup 3rd and 4th round home wins against Sunderland and Burnley respectively. After getting a first Champions League start in a 3–1 away defeat to Barcelona, Iwobi went on to score two goals in his first two Premier League starts in wins against Everton, and Watford, respectively. In the following season, Iwobi changed his squad number from 45 to 17. This was due to Chilean forward Alexis Sánchez taking up the newly vacated number 7 from the departing Tomáš Rosický. Iwobi went on to feature throughout Arsenal's victorious FA Cup campaign of 2016–17. As so he earned a winners medal as being part of the squad that beat Chelsea by 2 goals to 1 in the final of such. He achieved further success with Arsenal in the 2017 Community Shield, in which Arsenal beat Chelsea on penalties. In May 2018, after Arsenal manager Arsène Wenger announced he would be leaving the club, Iwobi described him as an "inspiration" and stated it was sad but exciting. In August 2018 he signed a new long-term contract with the club, reportedly until 2023. Iwobi started as a youth international for England, with whom he won the Victory Shield of 2011. Iwobi went on though to play for Nigeria. He made his senior debut for the Super Eagles on 8 October 2015, replacing Ahmed Musa in the 57th minute of a 2–0 friendly defeat to DR Congo in Visé, Belgium. He was selected by Nigeria for their 35-man provisional squad for the 2016 Summer Olympics. He was not a part of the 18-man final squad. In August 2017 Iwobi pulled out of Nigeria's squad for that month's World Cup qualifiers due to injury. On 7 October 2017, Iwobi scored for Nigeria in a 1–0 win over Zambia to secure the Super Eagles a spot in the 2018 FIFA World Cup in Russia. He was named in Nigeria's 23-man squad for the 2018 FIFA World Cup in Russia. He said that the team needed to learn from its performance after going out in the group stages. In April 2019 he said he wanted to emulate his uncle Jay-Jay Okocha by winning the Africa Cup of Nations. In January 2018 a video allegedly showing Iwobi at a late-night party 36 hours before a match was released. In January 2019, Iwobi was the subject of alleged racism from Indian actress Esha Gupta, an Arsenal ambassador. ^ "Player details". Confederation of African Football. Retrieved 26 January 2017. ^ "Alex Iwobi: Overview". Premier League. Retrieved 2 January 2019. ^ Taylor, Daniel (26 March 2016). "How Arsenal's Alex Iwobi became England's loss and Nigeria's gain". The Guardian. Retrieved 10 April 2016. ^ a b "Profile". Arsenal F.C. Retrieved 11 October 2015. ^ Lawrence, Amy (9 December 2016). "Alex Iwobi: 'I did extra training. My mum made me do kick-ups in the living room'". The Guardian. Retrieved 6 November 2018. ^ a b "How Alex Iwobi avoided an Emirates exit to become Arsenal's breakout star". The Independent. 14 October 2016. 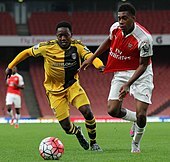 ^ a b "Arsenal's Alex Iwobi hoping to emulate uncle Jay-Jay Okocha's success". 19 April 2019 – via www.bbc.co.uk. ^ Simon Parker (9 January 2018). "Bradford City: Tyrell Robinson will not ease off after signing new contract". Telegraph & Argus. Retrieved 10 January 2018. ^ a b "Alex Iwobi signs new contract". Arsenal F.C. 6 October 2015. Retrieved 25 March 2016. ^ "Arsenal tie down young Nigerian forward Alex Iwobi to a new long term contract: but who is he?". The Daily Telegraph. ^ "Alex Iwobi Reveals How Close He Was to Leaving Arsenal After Talks With Premier League Pair". 90min.com. 15 December 2018. ^ "Results/matches: 2013/14". Soccerbase. Centurycomm. Retrieved 25 March 2016. ^ "Profile". Premier League. Retrieved 13 October 2015. ^ "Arsene Wenger 'used too many senior players' in League Cup exit". BBC Sport. 28 October 2015. Retrieved 1 November 2015. ^ Luke Reddy (27 October 2015). "Sheffield Wednesday 3–0 Arsenal". BBC Sport. Retrieved 1 November 2015. ^ Dafydd Pritchard (31 October 2015). "Swansea City 0–3 Arsenal". BBC Sport. Retrieved 1 November 2015. ^ "Bayern Munich 5–1 Arsenal". BBC Sport. 4 November 2015. ^ Critchley, Mark (9 January 2016). "Arsenal vs Sunderland team news: Alex Iwobi handed first-team chance, Petr Cech starts in goal". The Independent. Retrieved 1 February 2016. ^ Hytner, David (31 January 2016). "Arsène Wenger makes England quip over Arsenal's in-form Alex Iwobi". The Guardian. Retrieved 1 February 2016. ^ "Champions League: Barcelona 3–1 Arsenal (agg 5–1)". BBC Sport. 16 March 2016. ^ "Everton 0–2 Arsenal". BBC Sport. 19 March 2016. ^ "Arsenal 4–0 Watford". BBC Sport. 2 April 2016. ^ "Granit Xhaka to wear Arsenal No. 16 shirt, Alex Iwobi takes over No. 17". ESPN FC. 27 May 2016. ^ a b Dede, Steve (28 May 2017). "Arsenal star is an FA Cup winner". pulse.ng. Retrieved 29 May 2017. ^ a b "'Let's keep it going' – Iwobi lauds ARSENAL after Community Shield Triumph". Goal.com. ^ "Nigeria's Alex Iwobi says Wenger exit 'sad' and 'exciting'". BBC Sport. 3 May 2018. ^ "Alex Iwobi: Arsenal midfielder signs new 'long-term' deal". BBC Sport. 3 August 2018. ^ "Profile". The Football Association. Retrieved 11 October 2015. ^ "How Arsenal's Alex Iwobi became England's loss and Nigeria's gain". The Guardian. 26 March 2016. ^ a b "Victory Shield: Scotland U16 2 England U16 4". The Herald. Glasgow. ^ Oluwashina Okeleji (10 October 2015). "Arsenal's Alex Iwobi encouraged by Nigeria opportunity". BBC Sport. Retrieved 11 October 2015. ^ Oluwashina Okeleji (24 June 2016). "Kelechi Iheanacho included in Nigeria's Olympics squad". BBC Sport. Retrieved 25 June 2016. ^ "Olympic Football Tournament Rio 2016 - Nigeria". FIFA. ^ "Iwobi ruled out of Nigeria's World Cup qualifiers against Cameroon". BBC Sport. 27 August 2017. Retrieved 31 August 2017. ^ "Iwobi sends Nigeria to Russia 2018". ^ "World Cup 2018: Arsenal's Iwobi in Nigeria's 23-man squad". 3 June 2018 – via www.bbc.co.uk. ^ "Alex Iwobi: Nigeria must learn from 2018 World Cup". 19 July 2018 – via www.bbc.co.uk. ^ "Alex Iwobi: Arsenal forward faces fine over pre-match party claims". BBC Sport. 5 May 2018. Retrieved 1 February 2019. ^ "Esha Gupta: Has Instagram exposed everyday racism in India?". BBC News. 1 February 2019. Retrieved 1 February 2019. ^ "Games played by Alex Iwobi in 2015/2016". Soccerbase. Centurycomm. Retrieved 10 April 2016. ^ "Games played by Alex Iwobi in 2016/2017". Soccerbase. Centurycomm. Retrieved 20 December 2016. ^ "Games played by Alex Iwobi in 2017/2018". Soccerbase. Centurycomm. Retrieved 6 August 2017. ^ "Games played by Alex Iwobi in 2018/2019". Soccerbase. Centurycomm. Retrieved 23 December 2018. ^ a b "Alex Iwobi". National Football Teams. Benjamin Strack-Zimmerman. Retrieved 24 June 2017. ^ AfricaNews (7 January 2017). "[LIVE] Algerian Riyad Mahrez is 2016 African Player of the Year". Africanews. Retrieved 7 January 2017. ^ "CAF – CAF Awards – Previous Editions – 2016". CAFOnline. Retrieved 7 January 2017. Wikimedia Commons has media related to Alex Iwobi.